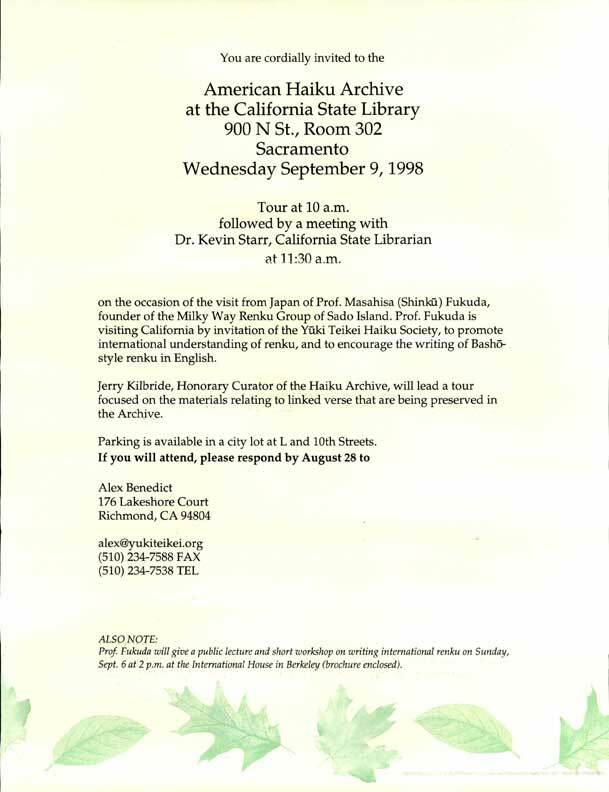 The American Haiku Archives advisory board occasionally sponsors special events at the California State Library, usually including a private tour of the haiku collections. These events have often been in conjunction with visits to Sacramento by American Haiku Archives honorary curators, or by other prominent haiku poets, scholars, or translators from the United States, Canada, Japan, or elsewhere. If you’ll be visiting and might be interested in a special tour of the archives, or want to know if any events might be happening soon (if not listed here), please contact the American Haiku Archives advisory board. 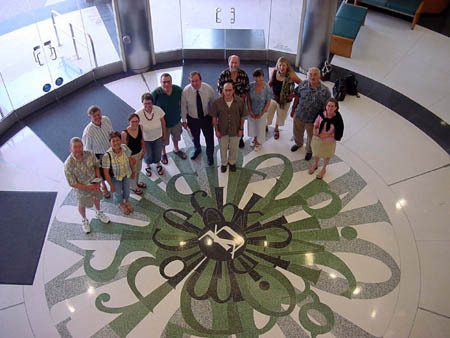 A national quarterly meeting of the Haiku Society of America also took place in Sacramento in June of 2006, and activities for the weekend included a tour of the archives. The American Haiku Archives and the California State Library in Sacramento hosted a gallery showing at the library of "Twenty Four Shikishi," featuring decorative poem cards with calligraphy and paintings by 24 of Japan's leading haiku poets. These shikishi were given to the Haiku Society of America in New York City in 1978 to celebrate the society's 10th anniversary, and were exhibited in celebration of the society's 50th anniversary. People interested in haiku and the American Haiku Archives came to a free tour of the archives on Saturday, April 9, 2011. Participants got a special tour of archived haiku materials usually not accessible to the public. They saw some of the Tokutomi papers as well as other papers, such as those of Jerry Kilbride, Kay Anderson, and Elizabeth Searle Lamb. They also learned about the process involved in archiving and cataloguing material. Special online exhibit featuring donors Kiyoko & Kiyoshi Tokutomi. Visit by Prof. Masahisa (Shinku) Fukuda from Japan. September 9, 1998 – See the invitation. A list of past events will be added as we can compile them. These events have included visits to the archives by Gary Snyder, Makoto Ueda, Shinku Fukuda, Cor van den Heuvel, William J. Higginson, Penny Harter, advisory board members, and many others. Each of these events has included a tour of the archives, and a couple of events have included receptions or dinners hosted at the library by Dr. Kevin Starr.